The enchanting Indian city of Udaipur has always charmed visitors, with its glamorous setting, rich history and grand architecture. Udaipur’s glittering lakes are the main attraction, along with its splendid palaces, narrow streets and the prominent ridges of the Aravalli Mountains stretching away in every direction. This fairy-tale like city was founded in 1559, and is dominated by the majestic City Palace, which overlooks Lake Pichola with its romantic island palaces. Picturesque havelis (intricately carved houses), ghats and temples line the lake front, with the bustling bazaars of the old walled city stretching behind them. Udaipur is one of our favourite cities in Rajasthan, as it seems to encompass all the rich heritage and colours that the state is famous for. If Jaipur is to be the Pink City, and Rajasthan the Blue, then Udaipur is a city of rose, cream and honeysuckle hues. It’s an impossibly dreamy city, with an easy-going atmosphere. Its sense of romance is unmatched in Rajasthan, and arguably all India. The colourful, crooked streets are bursting with small galleries and bookshops, perfect for browsing during a stroll through the lively markets. There are forts, temples and museums to visit all within easy reach – it’s a lovely place for simply pottering about and recharging your batteries after a journey through north India. Udaipur’s City Palace, stretching along the eastern shore of Lake Pichola, is a fascinating combination of Rajput military architecture and Mughal-style embellishment. Its stern, fortress-like façade, peppered with a profusion of elegant balconies and domes, has been aptly described in the past as a huge plain cake topped with fabulous icing. It’s the largest palace in Rajasthan, and is actually a complex of several palaces which were built or added to by 22 different maharanas between the 16th and 20th centuries. Much of it is now a museum, which is spread out through several palaces and is entered through the imposing Tripolia Gate (where the ruler was weighed on his birthday and his weight in gold distributed among his subjects). It is worth buying one of the catalogues that detail each room. Jag Mandir, built in 1620, is a palace located in the middle of Lake Pichola (not to be confused with the Taj Lake Palace, also located in the lake and now serving as a luxury hotel). The Jag Mandir Palace can be explored on a boat tour of Lake Pichola, which leaves from the banks near the City Palace every fifteen minutes. It boasts lush gardens and marble chambers, exquisitely inlaid with coloured stone, and eight stone elephants stand solemn guard at its entrance. This island palace provided refuge to Prince Khurram (who would later become the Mughal emperor Shah Jahan) while he rebelled against his father. The palace is believed to have inspired many of his ideas for the Taj Mahal. The charming Saheliyon-ki-Bari is a beautiful 18th century garden, located in the north of the city. Its name translates to ‘Garden of the Maids of Honour’, as it was built for a queen of Udaipur whose dowry included no less than 48 maids. The garden features ornamental fountains, a lotus pool and a rose garden. If you’re spending longer than a night or two in Udaipur, then a day-trip to nearby Eklingji is a must-do (14 miles out of the city). Eklingji is a holy complex of 108 temples and shrines, all dedicated to the Hindu god Lord Shiva. The main temples dates back to the 16th century, and marks the site where the founder of the Mewar dynasty received special blessings from a sage who lived there. It includes a striking pillared hall and four-faced image of Lord Shiva constructed in black marble. A stones-throw away is Nagda, which is home to the Saas-Bahu temples (‘Mother and Daughter-in-Law Temples’); two twin structures dedicated to Lord Vishnu, both of which were built in the 11th century. They’re renowned for their extravagant sculptures portraying amorous couples and scenes from the epic Ramayana. Fateh Sagar Lake lays north of Lake Pichola, and features a garden café on its island. The Moti Magri Hill is overlooking the lake, featuring a state of Udaipur’s great 16th-century warrior, Maharana Pratap, and his valiant steed, Chetak. The Leela Palace promises a luxurious stay. 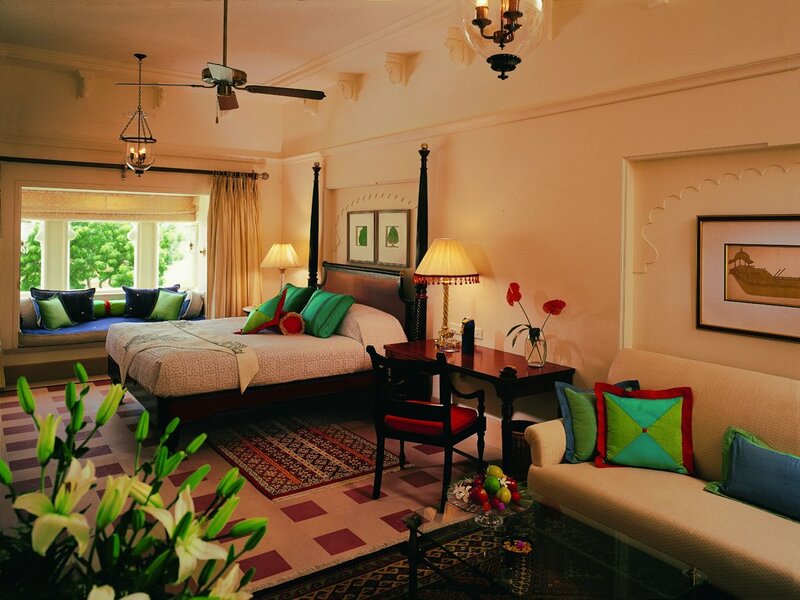 Its spectacular position on the banks of Lake Pichola ensures that each room has views over the tranquil lake. The palace took 14 years in total to complete, which is reflected in the incredible detail that has gone into the artwork throughout the hotel, and the intricate murals in the courtyards. The Sheesh Mahal restaurant offers some of the finest Indian cuisine in the region. Designed in the style of a traditional palace and blending perfectly with its royal surroundings on the banks of Lake Pichola, the Oberoi Udaivilas ensures a lavish stay. It’s the perfect haven to relax after a journey through Rajasthan, and makes the ideal base from which to explore Udaipur, if you can tear yourself away! The Taj Lake Palace has a unique location; on a tiny island in the middle of Lake Pichola. It is perhaps one of the most photographed hotels in the world, and the views of the City Palace which lies directly opposite are magnificent and uninterrupted.